Happy New Year, readers! And best wishes for a successful and prosperous 2012! While I’ve been browsing through old family photographs and correspondence, I came across some old postcards, mostly from the 1911-1914 period. 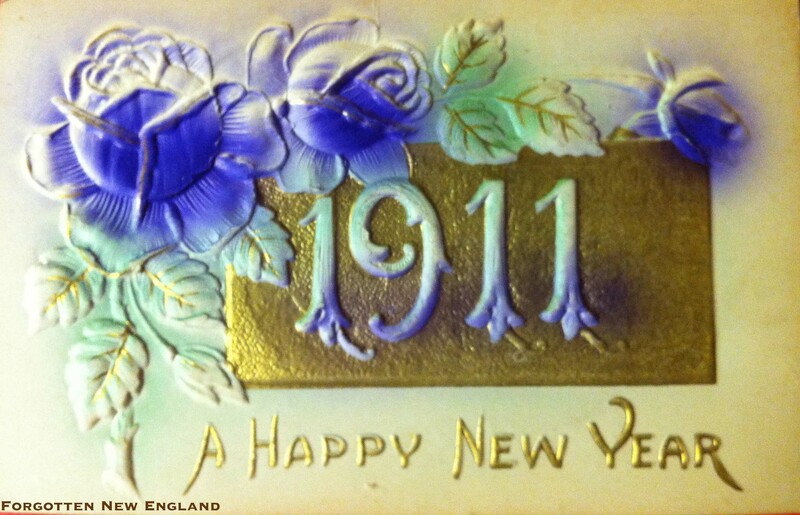 One of the first I found was this one, wishing a happy 1911. As we approach a new year, it’s common to reflect on the one that’s ending. This post will explore some of the themes and stories that were present in our ancestors’ minds a century ago, as 1911 came to a close. 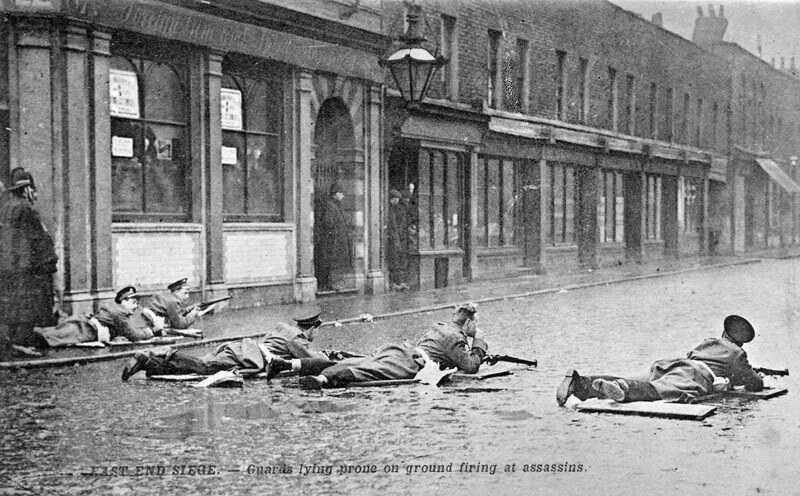 Soldiers from the Scots Guards open fire on the cornered anarchists in the Siege of Sidney Street in London, 3 January 1911. Image is from a 1911 postcard illustrating the siege. The year began with the world following the Siege of Sidney Street (also known as the Battle of Stepney), in London, where two members of a group of burglars with anarchist leanings were killed in a blaze that consumed their hideout and embroiled then-Home Secretary Winston Churchill in a controversy regarding his role in the skirmish. A major news story of 1911 was the ongoing Mexican Revolution, which had started in 1910 and raged throughout the year, resulting in the May 1911 overthrow of longtime president/dictator Porfirio Diaz, who had led the country since 1876. By March, such concern arose in the United States over what had become a civil war in Mexico that the US sent 20,000 troops to the border along with 15 warships. By November, the leader of the opposition forces of the revolution, Francisco L Madero came to power and assumed a presidency that would last less than two years when he was assassinated by military leaders who had remained loyal to Porfirio Diaz’s ideals. In February 1911, the world watched with horror as famine raged across China causing thousands of deaths and untold suffering. In the year’s first celebrity wedding, in February, John Beresford, or Lord Decies – an Anglo-Irish army officer, married Helen Vivian Gould, a socialite and daughter of a railroad executive and an American actress. Scandal rocked the US Senate in March, when an investigation looking into accusations of bribery and unethical campaign activities against Senator William Lorimer (R-IL) culminated in a failure to unseat him. A second investigation begun later in 1911 resulted in his unseating during 1912. 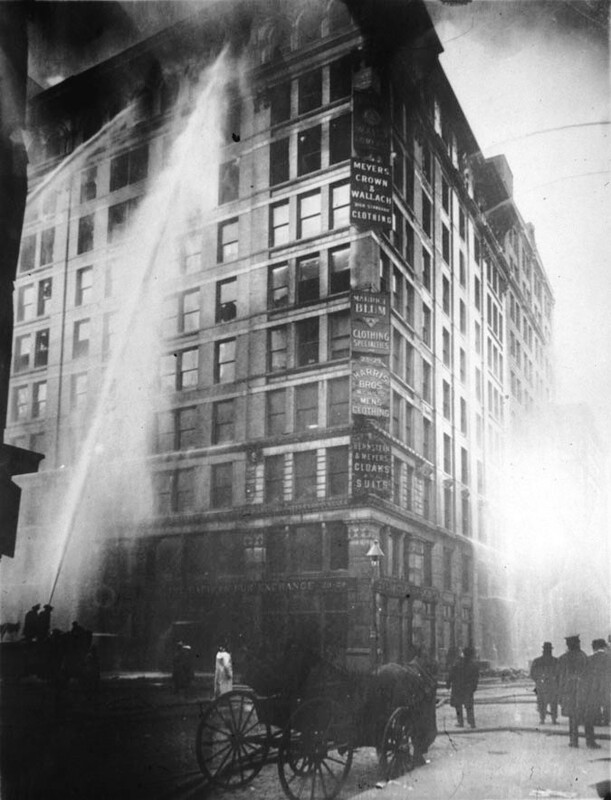 The Triangle Shirtwaist Factory Fire hit New York City on March 25, 1911, resulting in the deaths of 146 men, women, and girls. It remains the deadliest industrial disaster in the history of New York City, and the third-largest disaster in the city’s history. The majority of the victims, mostly women aged between 14 and 48 years of age, were recent Jewish and Italian immigrants who died from fire, smoke inhalation, or from jumping from the building’s eighth, ninth, or tenth story-windows to the street below. An investigation after the fire learned that managers had locked the doors leading to the stairwells and exits. Great advances were made in the field of aviation during 1911. Pierre Prier, a pilot from France, flew a monoplane from London to Paris without stopping, covering the 290 miles in about four hours. A non-stop flight today takes a little less than 90 minutes. Harry Nelson Atwood flew 576 miles on July 14 from Boston to the White House lawn and in August, flew from St. Louis to New York, making 11 stops over a 1250 mile distance. Before the end of the year, Calbraith Perry Rodgers made history when he completed the first flight across the United States on November 5, 1911. June 1911 saw the coronation of King George V, who remained Britain’s monarch through World War I and until he died in 1936. June also marked the silver wedding anniversary of President Taft and his wife Helen Herron Taft. Some 8,000 guests arrived for the gala held at the White House on June 19. The RMS Olympic, of the same set of White Star ocean liners that included the Titanic, completed its maiden transatlantic voyage when it pulled into New York in June. During the summer of 1911, the country commemorated the fiftieth anniversary of the battle of Bull Run, the Civil War’s first big battle. 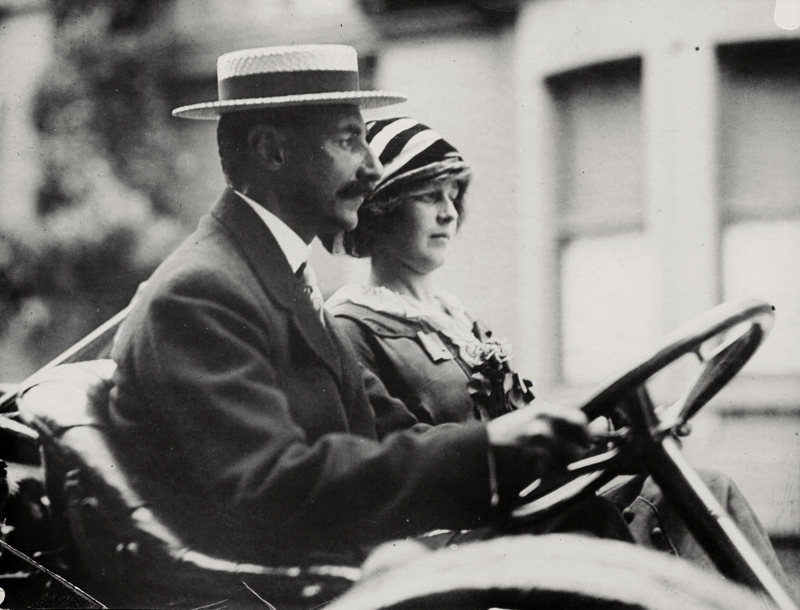 In September, the US watched another wedding – this one between John Jacob Astor and Madeline T. Force. She would later survive the Titanic disaster. He would not. 1911, specifically October, saw many deaths of the famous. On October 2, Read Admiral Winfield Scott Schley, hero of the Spanish-American war‘s Battle of Santiago Bay, died. About two weeks later, on October 14, Justice John Marshall Harlan of the US Supreme Court died. Justice Harlan, a lawyer and politician from Kentucky, was a strong supporter of Southern segregation statutes and the criminalization of interracial marriage. By the end of October, on the 29th, Joseph Pulitzer, a Hungarian-American journalist most famous for his namesake journalism award, died while aboard his yacht in Charleston Harbor. In November, Henry Clay Beattie, Jr. was put to death in Virginia’s electric chair for the murder of his young wife, Louise. Just weeks after the birth of their child, Beattie killed Louise while on a car ride late at night. He initially tried to blame a “highwayman” for the crime, but his story quickly fell apart. After his execution, he was buried, ironically, in the family plot next to the body of his murdered wife. 1911 closed with confessions obtained for what was then termed the “crime of the century”. In December, two Irish American trade unionists, John J. McNamara, and James B. McNamara, admitted to the 1910 dynamiting of the Los Angeles Times building and the Llewellyn Iron Works, respectively. At the conclusion of the trial, James was sentenced to life in imprisonment and John sentenced to 15 years. 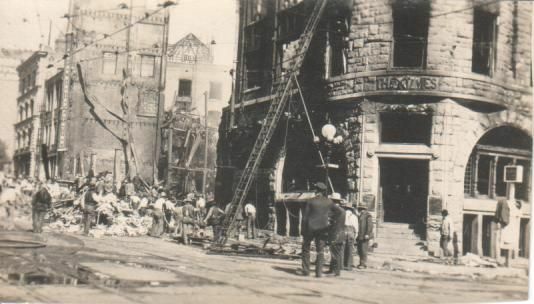 James’ crime, the bombing of the LA Times Building resulted in the deaths of 21 newspaper employees and injured 100 more. These events and names, so popular in our ancestors’ lives of a century ago, may not be so well-known today, but the themes – tragedy, war, and celebrity still ring familiar. 1912 might be best known today for the sinking of the Titanic on April 15. It’s also known as the year in which New Mexico and Arizona became US states. What will 2012 be known for? What new histories will be written? 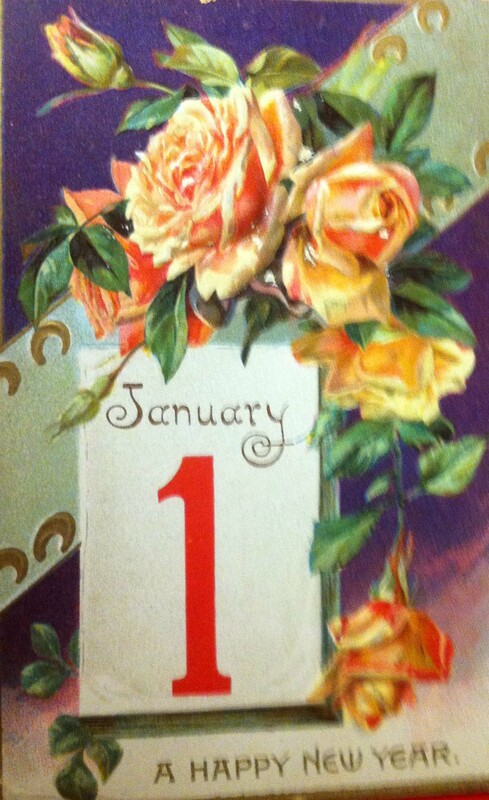 Happy New Year, readers, and best wishes for a successful and prosperous 2012! Thank you for a wonderful post, looking back a century. Love the photos as well – they’re marvellous. I’ve started thinking about what ancestors in my family were doing in 1911/12, and I think I’ll send the results around to my (adult) kids & cousins! Thanks again. Hi Celia – thanks for the comment. As I’ve been looking at ways to compile research, I’ve been thinking about what might be the most interesting format in which to present family tree/historical information. The world was a far different place in 1911, and in 1811. Where the names, dates, and map points end for our ancestors, providing some context around their lives and times adds a little more detail around what their lives might have been like. Happy new year! Ryan, great minds think alike! I did a post along the same lines. Yours focuses more on specific events, though, which is neat.